We pulled out of Quartzsite about 9:30 yesterday heading for Florence. We decided to take I-10 through Phoenix and then 60 east to Florence Junction and 79 south to Florence. The trip went very well. We spotted the truck route (I-10, 17 and 60) which we followed and it led us through the west side of Phoenix very smoothly. It was way nicer than places like Sacramento, Portland and Seattle on I-5 with their multitude of bridges and direction changes. We stopped for a long early lunch at a rest area where I took pictures of brittlebush and greasewood flowers then again at Florence Junction for a stretch and photos of some palm trees left over from some the scene of a long abandoned enterprise. We arrived in Caliente and had the trailer set up by 2:30. Fortunately, no neighbours were in evidence to witness or disturb backing into the very tight spot. It took several tries before we managed the deed. Several neighbours stopped later by to welcome us home. We really enjoyed getting back in the pool tonight and had four other couples to visit with there. First time we’ve had ten people in the pool at one time. This morning was busy. I went and got our new name tags first thing then we went to the land title office to do some business. Next was the insurance office to get a policy in place for Wednesday and the bank to pick up cheques for our new account. Aileen also got the mail box changed over at the Post Office and we picked up the application for water and sewer from city hall. After lunch we went to Coolidge for gas, groceries and a truck wash. Southern California and Arizona have a lot of mineral in the water and most water will leave white spots and streaks on the windows and paint. This car wash uses filtered water for the final rinse which gives a fine finish. I unloaded the pick up box and stored everything in our shed so we can haul home anything we find for the park model. The only furniture they left for us was a hide-a-bed in the living room so we will have to come up with a bed and table and chairs PDQ. I grilled pork chops on the BBQ at the end of the street and watched a reasonably nice sunset while cooking. We had heavy cloud part of the day so hopefully tomorrow will be nicer. There are four swimming pool complexes here and each has some grills, ours has four. Each also has shuffleboard and one has mini golf. We had lots of residents welcoming us home again today. Everyone is so friendly! This morning we had planned on driving to Casa Grande to look for used furniture. Several of the neighbours said they’d been recently and the selection was not good. Then Bill across the street came over and told us about Grandpa’s Furniture in Apache Junction so we headed that direction. Along the way we saw a store selling lift beds so we stopped in. We bought one with a queen mattress and two night tables to be delivered tomorrow. Then up to Grandpa’s where we eventually bought two swivel, reclining rockers and a small table with four chairs. They will also be delivered tomorrow in between Mitzy’s hair appointment and our meeting at the title office to close the sale. I walked around Tierra De Sol this morning and found several places the Caouette’s could rent. The lots in there are huge and can accommodate any size RV. I grilled a steak that we’d bought at Safeway for $2 a pound and it was surprisingly good. Aileen says we’ll get five meals out of the $9.71 steak. Aileen and Mitzy are glad to be back walking in familiar ground and meeting their respective two and four legged friends. We took Mitzy for her haircut and when we returned the bed was already in place. Good thing I’d left the door unlocked. Neighbour Daryl was kind enough to come over and supervise as the delivery guy didn’t want to enter without someone on hand. Shortly after the chairs and dining set arrived. We immediately started moving stuff from the Arctic Fox to the park model. We had our lunch in the new digs then went to town to finish closing the sale. Just back from that and doing some paper work at the office when Jordans called that they had turned down at Florence Junction. They were by themselves as Caouettes decided against coming. We went and waited at the highway and they arrived in about 12 minutes. The park manager insisted on measuring their motorhome as we said it was 36 feet which is the maximum permitted by the city. After a long hunt for a tape the motorhome was declared legal. So then J’s were allowed to get their renters tags. The motorhome fits on the lot just fine. I cooked steaks again for supper. We’ve been experiencing Quartzsite for the past several days. 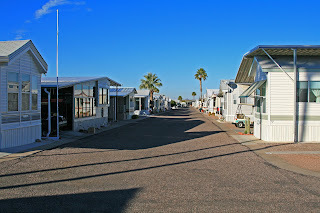 Aileen and I have been to the big tent RV show, to some of the flea markets and even a couple RV lots. I have been fairly restricted this year as my legs are giving me a lot of grief. Not sure what it is but my right knee has been quite swollen and my left calf is very painful. Walking makes things worse. 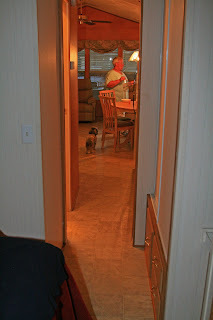 We did visit Howard and Linda Payne yesterday who call their RV experience RV Dreams www.rv-dreams.typepad.com . I have read their blog since soon after they started it and followed along with them as they researched then bought their Ford 450 and huge 5th wheel. They’ve been full timing for over three years and are only 45. They work camp their way around the country so instead of putting lots of miles on they get to stay and explore each area thoroughly. They then tell the rest of us what they find and show us pictures. Since there were only a few days when we were both here in Q, it was nice to find them and meet in person. We will have another look around the shows today then tomorrow head back to Florence to finalize our purchase and get things organized before departing for BC in mid February. Jacquie and Jim are going to follow us over to Florence on Wednesday and we were able to rent them a spot for a week or two. 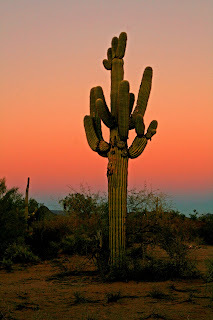 We will be picking up Wendy and Randy at the Phoenix airport on February 8th. 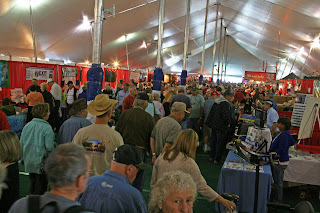 Day of the Quartzsite RV show - the whole place was this crowded! 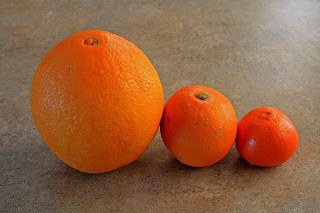 All three are oranges! The big one is over 4 inches. Aileen said the girls enjoyed their night out and the Johnny Cash impersonator was pretty good even though he was ill with a cold. I puttered on the computer then went and enjoyed the pool and hot tub. At one point there were 9 of us in the water and all were from BC, Alberta, Saskatchewan and Manitoba. We dumped the tanks and loaded up on water then hooked up and departed by 9:40. We arrived in Quartzsite, Lo Posa West camp area, shortly after 11 and were able to see Jordan’s and Caouette’s from the gate house. We are parked with them and will likely be here for the next 8 nights. Jim is hopeful we’ll be able to get internet here. He has talked to them a couple times and they’re working on getting things up and running here. I posted some pictures this morning in Yuma but it was quite chore. I guess the server wasn’t strong enough to handle the pictures as I ended up doing them one at a time and it took between 3 and 12 minutes per image! When you scroll down the pictures and come to the bottom of the page, click on older posts to see my last written post as each picture has become a new post thus using way more room. I went to the RV show this morning for two hours. I did manage to get through everywhere but just barely. There wasn’t room for anymore people in the huge tent. I’ve no idea how many were in there but it would be several thousand. And it was just as crowded all around the outside at those exhibits. My only purchase was a campsite guide for Canada and the US which is 1,575 pages thick. Aileen stayed home as she isn’t foolish enough to venture into those size crowds. Mitzy was under the weather for some reason today and needed the company. She wouldn’t eat until later this afternoon and that was stimulated by some popcorn! After lunch, we went for a drive through all four BLM camping areas. While there are a lot of RVs in spots, there is room for thousands more. We’re pretty lucky where we’re parked as there is new pavement near us but most of the outlying areas are suffering lots of dust. It’s a tradeoff, we have to sleep with ear plugs here or get covered in dust in most other spots. Jordan’s have internet now. They had to drive across town to find a strong enough signal to get signed up and now can log on to a different signal from the same provider. It seems that is what I’ll have to do, I guess. There was a hot air balloon being lit up for awhile tonight not far from us. I didn’t take any pictures as the foreground was too busy and I couldn’t get the whole balloon. We’ve decided to stick with plan A and not bother buying internet. We’ll keep searching out free WiFi. Therefore the blog posting will continue to be sporadic. We’ve played Mexican Train all three nights. The first night we played the Chicken Foot variant and the regular game the last two. We went to a Mexican restaurant last night and the food was excellent. I brought almost half my taco salad home so that will be lunch today. Happy Birthday to my brother Tom today! I will try to get this posted this morning. I have several pictures from the last post that I will attempt to get online first so you might want to scroll down below this posting to check them out. 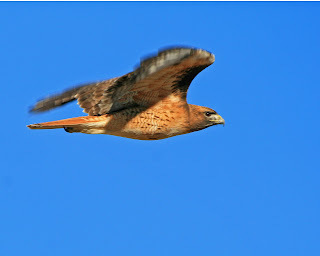 Red Tailed Hawk - grab shot. Looking down our street in Caliente. Brick ranch house in Alamo Canyon. 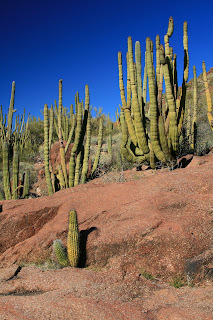 Organ Pipe Cactus - Alamo Canyon. 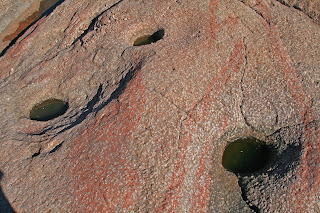 Indian grinding holes along Alamo Creek - Organ Pipe Cactus National Monument. Alamo Creek, Indian grinding hole in front. It was after 10:30 when we finally departed Caliente. The warning centre in the truck told me I had a problem with the trailer brakes so it took a little time to figure out the main connection was a little corroded; after wiggling it some it worked fine. 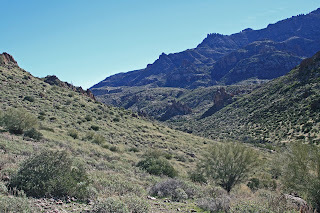 We drove to Casa Grande then took #15 south west through the Tohono O’odham Indian Nation. We saw over a dozen border patrol vehicles and actually saw them apprehending a couple of guys along side the road. We found the Why BLM free parking area mid afternoon and got set up after registering. Half of the dozen units in here are from BC including one from Sunnybrae near Tappen. It’s warmer here than Florence area. No internet, electric or swimming pool so off to bed shortly after 8 PM. Stayed abed til nearly 8 AM! Cooked bacon and pancakes outside this morning then mid morning we gassed up in Why ($1.759). Why was named for the Y the road makes with one road leading to Tucson and the other to Mexico. 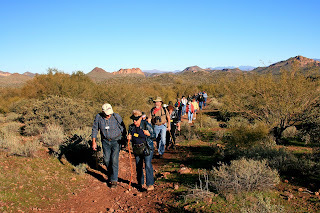 We spent most of the day puttering our way around the 21 mile single lane, one way loop road in Organ Pipe Cactus National Monument. Stopped lots for pictures and walked around extensively. I was wise enough to throw Aileen’s suduko book in so she could keep occupied and not miss me. The weather was absolutely gorgeous with the temperature getting up to 24C but the wind kept it from getting too hot. It was certainly different from last February 15 when we were here with Wendy and Randy and the high was about 4C and it rained lots. We found a nice windy spot to have lunch so we didn’t get too warm. Only two vehicles went by in the 1 ½ hour we were stopped. Only about 8 the whole day, in fact. Where is everyone? Our camp area is almost empty, the road is very quiet. In fact, about half the vehicles I did see on the highway have Mexican plates on them. I’ve noticed quite a number of Saguaro cacti in the area missing their main stem with usually side stems growing up to replace it. I haven’t found the missing piece laying on the ground either. Tonight I think I solved the mystery when I came upon one that was short enough to look into. The centre of the trunk is all charred so I believe they’ve been struck by lightning. I guess it stands to reason when they are about the highest thing around. Both nights I’ve walked across quite away to find a foreground for the sunsets. Aileen came later last night with me guiding her by walkie talkie. She didn’t join me tonight so I stayed out later. I could barely see my way and for awhile I wasn’t sure which trailer to head for. I could see a couple gleaming whitely. It’s so flat here you have trouble seeing very far because there’s also lots of shrubs that are 5-6 feet tall. 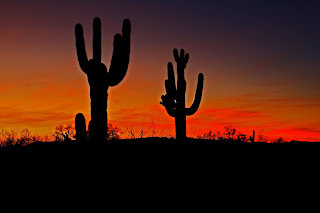 I used different foreground cactus tonight which were quite a bit further than last night’s. This morning we went to Alamo Canyon. Since pets weren’t allowed on the trail, I walked up and checked it out. There had been a ranch of sorts in the old days. The brick house walls are still standing in good condition. Further on was quite a surprise – a cold, clear flowing creek! One pool was at least 4 feet deep. 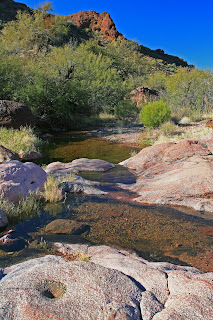 Within half a mile the creek disappears in the open desert. 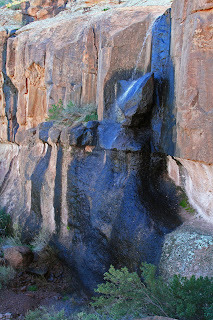 There were Indian grinding holes in the rocks alongside the corral, well and water tank. 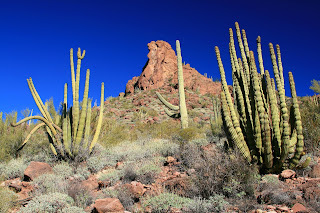 I read the Indians had been here at least 11,000 years ago and the Sonoran Desert has only been a desert for 10,000! We saw more border patrol agents at work again. Four of their vehicles were parked and I presume they were on the trail of some illegals. We had parked in a side road for lunch but hadn’t gotten our food out yet when an agent moved us along. We checked out the road behind the visitors centre which only goes 5 miles to a locked gate. It used to be a 50 plus mile loop but for some reason is no longer available. Aliens, lack of manpower or turning it into wilderness are all excuses I’ve heard. No idea if one is accurate. We also drove down to the Mexican border at Lukeville where we had an ice cream cone. We got back to the trailer before 3 PM where Aileen had a short nap. I sat in the sun for awhile then Mitzy and I went for a walk across the desert. We have to make sure we carry water for Mitzy as she needs to drink often when it’s warm. With her short nose, she has no built in air conditioning. I made one last try at a sunset but it fizzled on me. Aileen turned on the porch light for me to find my way back which made it easier. Aileen chatted with friend Bev in Victoria tonight and friend Wendy in Salmon Arm this morning. Mitzy’s groomer in Florence called to confirm her appointment when we return in a couple weeks. 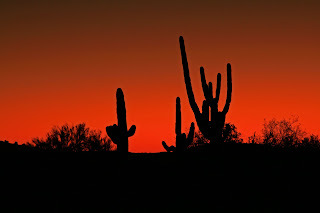 Tomorrow we move on to Yuma and hopefully will have internet so I can post another installment. Here we are in Yuma. Didn’t bother getting internet hooked up yesterday as we were busy and they charge US$5 per day!!! 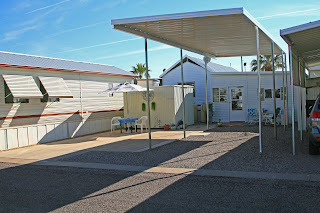 We found Cactus Gardens RV Resort easily with Edna’s directions and they met us at the office. They’d arranged for us to park right across from their trailer so that was handy. We went a few trailers down from them to their RV friends from home, jam session. Awesome music and such a wide variety. I could listen to that forever. Ray barbequed a chicken for supper then later we played chicken foot – a variety of Mexican Train. That was fun. This morning, Ray and Edna took us off to a large flea market. We bought some veggies but left everything else. We four went to the Daybreaker Café and had a really nice lunch. Aileen had sweet potato pecan pancakes and reports they were excellent. Aileen is napping this afternoon as she and Edna are going out with the girls tonight to a Johnny Cash tribute at another RV park. I thought about going but decided it would be better to leave the girls on their own. I’ll catch up on the computer and go to the pool and hot tub. Hiking and partying through life! The waterfall is up in the top part of the image. 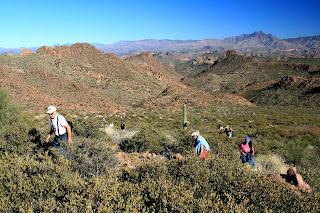 Scenes from Massacre Grounds hike. I was up by 6:30 this morning to join the hiking group. 30 people came out today so a hard group to manage as their fitness level ranged from pretty good to very marginal. 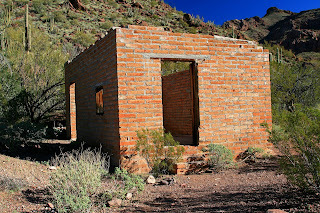 We went east of Apache Junction and Lost Dutchman State Park to the Massacre Grounds trail. We gained something in the range of 900-1200 feet elevation and three of us probably did about 8 miles total. One lady had to drop out after about ½ - ¾ mile because of her knees. A real bonus for me was finding a waterfall (with water!) at the end of the trail. It wasn’t very wide but did spray our nicely at the bottom. It was in the shade and very cool which was refreshing after our climb in the sunshine. I felt pretty good hiking today. I was worried as I’d been feeling so puny the past few days. I came off the mountain quite quickly as the others had turned back long before and I didn’t want them waiting. I arrived back with the main group as it turned out and then sat and waited for the stragglers. We were home by 1:30 which still amazes me as we never had such short hikes at home. We had a busy day here today. Aileen gave Mitzy a bath then me a haircut. Several people stopped by to chat – some we knew, some we didn’t. I talked to the guy we bought from, and the office, to plan how we return to the park in a couple weeks as name tags are required. We’ll park on our new lot and pretend we’re renting from Jim and Betty. We went to town earlier to the Post Office and then opened an account at the local bank. After lunch we went to Coolidge. Aileen had a haircut then we checked out the thrift store which has used furnishings etc. Gas and groceries rounded out the trip. While Aileen put things away, I took Mitzy for a walk in the desert out back. On our return, Aileen was visiting Evie and Bobby who are our new neighbours beside the empty lot. We spent an hour (and a drink) there before we had to rush off to Dalgleish’s for supper. Sylvain and Rita plus Norm and Sheri were also there. They are close neighbours on our street. Actually the supper was mostly prepared by Norm and Sheri. We’d been invited this morning were happy to meet more friends. We spent quite awhile visiting (and more drinks) then had a nice late supper. It was a great evening which almost went awry when Sync’s chair leg fell in the furnace duct hole when the grate moved aside. He toppled over sideways rather gracefully with only minor damage to the curtain and window sill. Hopefully he has no ill effects later. We had to leave finally as Aileen was pooped and the others took that as a good time to go as well. She couldn’t fit in a nap today and had done a lot plus some wine. She did manage to help me cover the pool though, after I swam and soaked in the hot tub. We went to the clubhouse for breakfast this morning. Sat with Doyle and June who are neighbours on the same street as our back lot. Aileen did laundry while Mitzy and I went for a walk on the desert. We go to the clubhouse for supper and a show tonight. Tomorrow we hook up the trailer and head down the road somewhere eventually arriving at Yuma then heading up to Quartzsite. There’s no route planned yet. We plan on returning here about Jan 25. View of our back lot where we'll park the trailer. #317 E Occotillo. 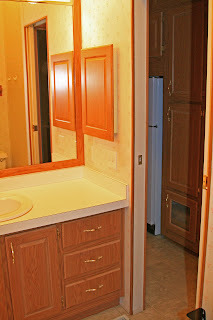 Visible is the back of our park model trailer shown in the next picture. 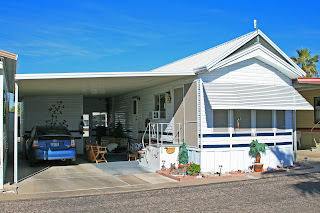 Front view of our new winter residence in Caliente Casa De Sol, Florence, Arizona. #318 E Palo Verde Lane. I took pictures but the program won't let me load them today. Maybe tomorrow. We made the plunge this morning and bought the park model trailer two over from us along with the lot directly behind it. Each lot is about 30x40 feet and there is a shed on each. The main lot with the trailer has a metal roof over the whole space and the back lot has a cover for an RV. We’ll park our trailer there to keep it protected from the sun and for use as a guest cottage if someone happens to visit. We’ve been idly looking ever since arriving here and early on Aileen had decided Jim and Betty’s was what she’d like. Then suddenly last Saturday, they told us they’d bought another and their lots were now for sale. It didn’t help that was the day I came down with a flu bug or something but we had to do lots of scheming to figure out how to put the deal together. They kindly gave us four days to make up our mind before openly advertising it. There were already others interested, we know. There is quite a flurry of activity happening with both sales and rentals. All of a sudden there’s nothing left to rent and people are constantly scurrying about looking. Our closing date is January 28. 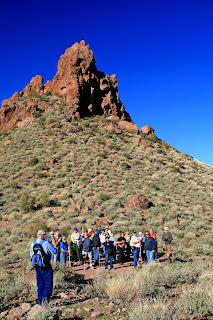 We are going to continue with our previous plans and head over to Yuma and Quartzsite, probably this Sunday. The only change is we’ll come back afterward for two or three weeks until time to head for BC. That way we should be able to make some plans for what is required next Fall. We don’t know at this time what will be left in the way of furniture. It will probably depend on what Jim and Betty can’t squeeze into their new place. The park model is a 1992 but has been kept up quite well and has several fairly new things like water tank and taps, flooring and lots else. They seem to be quite proactive in that department. The metal roof over top helps to keep the heat down. It isn’t quite how we’d planned (actually, we didn’t have a plan!) to do it but we felt this opportunity was too good to lose. We still intend to keep our house rented out and travel Canada during the next few summers then decide what to do for summer residence. Aileen and I wish you the best health and happiness you can manage for 2009. We stayed home yesterday. Aileen gave Mitzy a bath, much to M’s disgust. Later, I took Mitzy for a good walk in the desert. It was very warm so she was pooped when we returned. The temperature is getting up in the low 70Fs right now which equates to low 20Cs. Aileen had a long nap in preparation for the party evening. I spent the latter part of the afternoon sitting in the sun reading. We went to the clubhouse for the New Years party and had a good time. We met some more people and have an invitation to go next door to Florence Gardens to visit a couple from Ontario. The doors open 15 minutes before events normally and it’s humorous watching the antics. Last night there were about 30 people lined up just after 7 PM when I took Mitzy to the dog park. Doors opened 7:45. It reminds me of the old school bus lineups with people jockeying for position. I think it was a sell out crowd; there didn’t seem to be many empty seats. They are a real dancing crowd. At times the floor was very full. The two piece band played a wide range of music which was enjoyable to listen to as well as mostly good dancing. Aileen and I took our bottle of Malibu Rum to keep us mobile. There was tons of finger food so we were able to keep our strength up as well. We stayed til the band quit a little past 12AM. Aileen and I probably danced at least half the dances! Took quite awhile to settle down back at home. Mitzy met us at the door in a hurry to visit the dog park. What a crowd there was there. I think eight other dogs all being walked and the general consensus was they were all in a hurry when their Mom and Dad got home. Kind of funny at 12:30 AM. I went off to the shower house while Aileen decided on a bath in the trailer. We didn’t get to sleep later than normal as Mitzy wanted her usual trip to the dog park at 8. We took it cool today. The big job was taking down the decorations. Must have taken nearly 10 minutes! Aileen had a good nap later and I went for another stroll in the desert. At 4 PM we went to the New Years supper at the boardroom. I think 14 couples attended and we had a great time. We got to meet several new people and some that we’d met previously. It was a great potluck with a wide variety of dishes. A neat thing was going around the table and having everyone speak about themselves. Later we played some kind of game of which I was one of two winners, my prize being over a pound of chocolate pieces which I sent around the table as I no longer devour chocolate since I identified it as one of my migraine triggers. There were some pretty interesting things mentioned and some were hilarious. We were home before 8 then after a bit we went to the pool. We had a call from Garry and Barb in Duncan and it sounds like they’re pretty tired of this winter. It was another low key day. Mid morning, we walked over to visit people we met at the dance but they weren’t home. I barbequed wieners for lunch and later Aileen had a long nap. I managed to get quite a bit of reading in lounging in the sun. It was a little cooler today as the wind had a tang to it. Beautifully clear still but still forecasting showers by Sunday. I dug the printer out and made a bunch of 4x6s as Aileen wanted some more cards made and I wanted to send some prints to Mom and Dad. My Canon Pro 9500 printer lives under the bed and it is hard on the back getting it in and out. It and my laptop pretty much fill the table when printing. It sure is nice to be able to make prints on the road though. We had company in the pool tonight. A young couple from small town Montana (Broadus) are visiting her Mom. More and more people are coming now that the holidays are done. Several people are actively searching for property. Three or four groups toured the park model beside us. Others are rushing around with lists in hand. We hadn’t planned on going anywhere today but a screw came loose on my glasses and after tracking down a set of tiny screwdrivers at Daryl’s across the road and trying unsuccessfully to repair it, we had to go to WalMart in Coolidge. They fixed it easily but she said she had to install a new screw. I couldn’t have fixed it myself if I’d tried all day! She also cleaned and adjusted my specs, all at no charge. I dug the printer out again today to put a message in a card for Joni whose birthday we’re invited to tomorrow. I also printed Mom and Dad’s letter to go with the prints. Tonight in the pool we met a lady from Kansas and another from Kamloops. Their husbands came by and visited but didn’t come in the pool. The people from Kamloops rented Wendy and Randy’s trailer last year. I’ve been ill the past couple days with headache and stomach ails. I picked up a bug somewhere I guess. I’m posting this from the trailer so no pictures today. The router signal is too weak to allow uploading images. Joni’s party went well. There was a good sized crowd and lots of food which her husband Pete had prepared. Joni made a couple of speeches and she was pleased to have her son and his girlfriend here from California. We’ve had rain the past couple days, ¼ inch yesterday, and today has dawned sunny and bright again. Hopefully this bug will go away so I can get back to doing again.